I belong to a PPLG (principal’s’ professional leadership group) and we have been reading ‘The Principal – Three keys to Maximizing Impact” by Michael Fullan. At our meeting last week, we focused on chapter three, The First Key – Leading Learning. It is a fairly substantial chapter, and it covers a wide range of things an effective educational leader does. All of which are very useful and powerful considerations we can use to improve the day to day impact our leadership has on our schools. One concept I am particularly interested in is the concept of capital – professional, human, social and decisional. I am really interested in what it means to build the professional capital of your team, and how the interplay of human, social and decisional capital underpins this professional capital. It left me wondering, how well do we maximize each of the areas of capital in order to grow the success of our teams? With this in mind, I wondered if It would help to look a little closer at each of the areas of capital, and to ask some key questions as a type of barometer of how well placed we are in terms of maximizing each area. Perhaps these questions might help you grow the capacity and capability of your teams, and assist you to conduct a self review of the professional capital at your place. This is where you are building the capability and capacity of your teams, both individually and collectively. Does the process need to be differentiated or whole school? How will it be scaffolded for success and how is expertise shared across the teams? Is coaching or mentoring an appropriate vehicle, and if so, how will this be used to grow your team? What elements of collaboration are in place? How are you giving time and precedence to this process, and is it carefully paced? Most importantly, how is this going to enhance student achievement and learning? This is the quality of the teachers and team at your place. Think about it as your teams human resources, and the basic teaching (or work) talents that each member of your team bring to the job. By gathering information on the classroom experience and qualifications of individual teachers you can improve on the human capital at your place. It is important to attract and improve the human capital at your place. Professional development, authentic feedback, trust, support and high expectations help strengthen and grow human capital. How good are the recruiting processes at your place? How well do you cultivate and grow the talents of your team? Do you know the strengths (and next steps) of the members of your team? How well do you know what each of your team do, and what part they play in your team so that you can maximize their impact? Who on your team are critical in assisting you with growing talent? What systems and processes do you have in place to ensure the quality of your teams work? Does your appraisal system help you grow your team and highlight strengths and next steps? Is it a ‘done with not done to’ process? 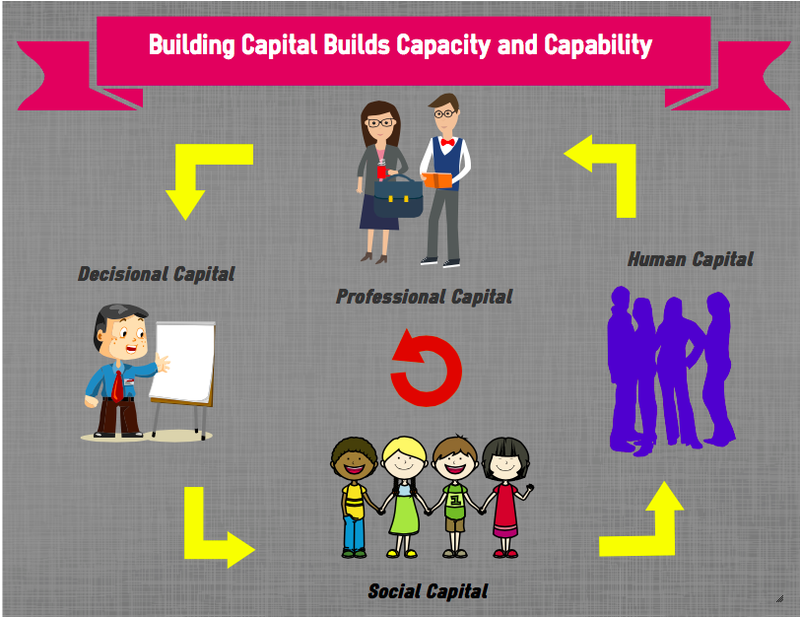 Social capital relates to the quality and quantity of the ways people interact with each other. In short, this is all about relationships. For teachers it is about how they work together, and how they access and share knowledge/understandings across the organisation. For all members of your team it is what trust looks like, the expectations they have of themselves and of others. It is also how committed each member of the team is to the common cause – to your vision of what it is you want to achieve. In short, it is the foundation of your school/organizational culture. Social Capital (the group) helps drive long-term change and helps to improve individuals because of the impact of collective efficacy. Michael Fullan would say that “good people will not stay in places that are unproductive”. What does collaboration look like across the school? What opportunities are there for collaboration for your staff, and your community? Do people know what it is you stand for – what your collective vision is? Is there a sense of a collective efficacy where ‘we are in this together’ and how do you know? How do you engage your community and staff? What are relationships in the wider community like? This relates to the processes or systems that people have at your place to make decisions across a multitude of areas. For me, this is teacher voice and agency in action. This grows over time. It is also one of the least strong areas in any team. Do the people at your place get the opportunity to participate in decision making processes? Do your people have the ability to make good decisions? How do you know and how do you grow this? Finally, these are skills that we all need to build up and improve upon. Leaders also need to develop these. If you are the leader at your place, how do you foster, grow and develop these? When do you know to step back and let it happen, and give them space?